Most of the post-election jockeying about taxes has been around one issue: raising income-tax rates for the wealthiest Americans. All signs seem to indicate that this will happen. If we were to return to tax rates in force under President Clinton, the top tax rate would move from 35 percent to 39.6 percent. President Obama argues for taking this step based on the idea that we’re all facing a fiscal crisis together, and we all have to pitch in to help solve it. The rich can afford to pay a little more to help, and they should, as a matter of fairness, the president argues. Odds are that he’ll be victorious. The truth, however, is that this step, by itself, will bring only about $70 billion a year into the federal government’s coffers. By comparison, the deficit this year is expected to run about $900 billion. So, the deficit won’t begin to be addressed by taking this step alone. Obviously, we’re going to have to cut spending, but we’re also going to have to find other ways to increase revenue. Mitt Romney and Paul Ryan’s ideas about tightening tax breaks need to be seriously considered as one path for doing this. 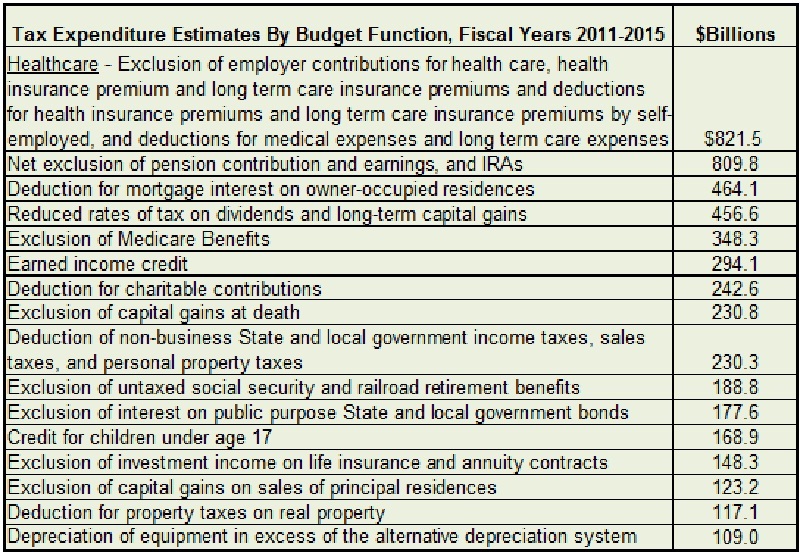 Look at the chart below from the Congressional Joint Committee on Taxation, and you’ll see how much revenue the federal government will forego over five years because of exclusions, deductions, credits, deferrals, exemptions and preferential rates. (They’re called loopholes when people don’t like them and incentives when they do.) Over five years, they total more than $4.9 trillion. That’s serious money, and some of it needs to be collected. That means limiting tax breaks. Are you willing to do so, even if it could hit your pocketbook? I think we need to be willing; we’re all in this together, and we’ll all have to sacrifice. That’s never a popular word in politics, but it’s one that has to be said. This entry was posted in Politics, Society. Bookmark the permalink. I’m not opposed to reviewing the tax code to determine which of the incentives should be reduced or eliminated. My concern is that there have been no specifics put forward thus far. Each of the listed incentives was created for a reason, so my first suggestion would be to determine if the original reasons remain valid. I also think that care should be taken so that the incentives that are intended for the poorest among us (like the earned income credit) remain as they are.